Nagaland governor PB Acharyaon Saturdaysaid the universities shoulder the responsibility of producing not only educated but also well equipped and highly skilled manpower for overall development of the society. He also emphasized the importance of having dialogues among universities, industries and the trade sector for the development of Nagaland and employment of the students after they pass out. 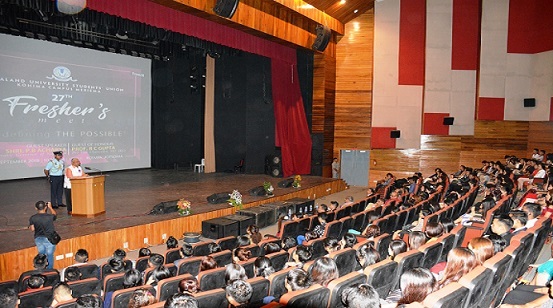 The governor was addressing the formal session of the 27th fresher’s meet of Nagaland University Students’ Union, Kohima Campus Meriema, as the guest speaker at Regional Centre of Excellence for Music and Performing Arts, Jotsoma. According to Acharya, the universities play a crucial role in providing students with new knowledge and skills needed to meet countless challenges in a changing and globalized world. He called upon the students not to shy away from hard work as work is worship. The governor also exhorted the students to take up entrepreneurship and be job givers and not job seekers. Stating that the government sector has reached a saturation point for employment, he said youths need to look beyond government jobs. “Students have to excel not just in academics but expand their interest in other vocational education in order to acquire relevant skills, including skills needed for work and entrepreneurship,” Acharya said. Acharya informed that the central and state governments have introduced various welfare schemes and programmes for the youths to help them stand on their feet. He asked the youths to avail such programmes for their benefit. Pro vice chancellor of the Kohima Campus of the university, Prof R C Gupta also spoke on the occasion.